The consolidation of Washoe County Water Resources and TMWA in 2015 has created many opportunities for improving conjunctive use of our water resources throughout the Reno-Sparks area. “Conjunctive use” means using surface water from the Truckee River whenever possible and resting and recharging wells in critical areas. 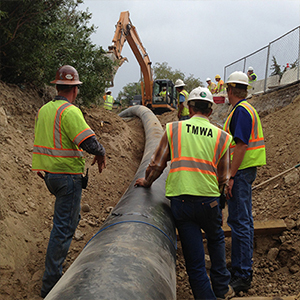 The $4 million Arrowcreek Drought Response Phase 1 Project is a component of TMWA’s implementation of the conjunctive use approach in Southwest Reno. The project was brought online in April 2016. By pumping a supplemental water supply to the upper reaches of the Mt. Rose alluvial fan area, TMWA has been able to significantly decrease groundwater pumping from the Mt. Rose and Arrowcreek wells. In the May– August 2016 time frame, pumping from wells in the Arrowcreek and Mt. Rose systems decreased by 495 acre-feet (161.6 million gallons) when compared to the same period in 2015 (42 percent less than 2015). These new facilities will allow TMWA to implement a conjunctive-use plan in the Mt. Rose and Arrowcreek systems this winter by serving the area with treated surface water and turning off the wells for an extended period of time.